22 pieces; net wt. 10.5 oz. Allergen Information: All Godiva dark, milk, and white chocolate may contain dairy or milk products and nuts or peanuts in addition to gluten. Any person with a dairy allergy, nut allergy, or gluten allergy should not consume any Godiva product. Founded in Brussels, Belgium, by Joseph Draps 80 years ago, Godiva Chocolatier is a world leader in super premium chocolate. Belgian in origin but uniquely Godiva in execution, the Godiva style comprises exquisitely balanced counterpoints of aroma, flavor, and texture found in chocolates available in more than 80 countries. Godiva Chocolatier offers a range of chocolate products from iconic European-style Gold Ballotins to handcrafted seasonal packaging. 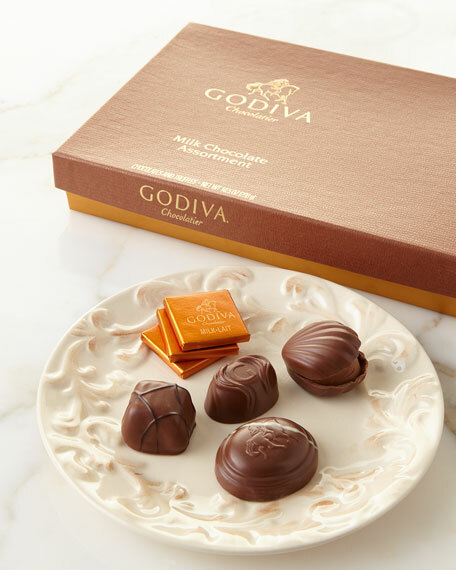 Today, Godiva embodies the same careful attention to detail executed by the founder more than 80 years ago and continues to use Joseph Draps' original recipes.